Order Picking and Routing Strategy – Why Does it Matter? Warehousing and storerooms are at the center of spare parts inventory management. Whatever the reason that a company needs to hold spare parts as inventory, they need to hold them somewhere and in an organized manner. Depending on the industry, this space may be referred to as the warehouse, storeroom, storehouse, store, stockroom, or crib. For the purposes of this post we will use the term warehouse. Someone needs to place an order. In an engineering warehouse this could be a simple as someone fronting up to a counter or window and verbally requesting a part. In an OEM or service spares warehouse this could be via receipt of a purchase order. There is a whole spectrum of possibilities between these two examples. Someone needs to pick the order. This means that someone needs to retrieve the item and transport it to a despatch or packing point. This may be facilitated with automation, conveyors, forklifts, trolleys. Or it may be someone simply walking a route and retrieving the item. In all cases, the physical issue is the same: the item is removed from a storage location and moved to the next step in the logistics chain. Determining the pathway is referred to as routing. Together these two actions can be referred to as order picking and routing. Why is an Effective Order Picking and Routing Strategy Important? The reality is that, despite the improvements in warehouse automation, in the vast majority of warehouses, order picking is a manual process. From the simplicity of physically walking the route through to assistance with mechanized transport, the common factor is the involvement of people – that is labor. In some research it has been estimated that the effect of this labor is that order picking costs can account for as much as 50% of warehouse operating costs. 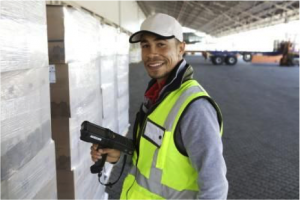 This tells us that the key to labor efficiency in the warehouse, is therefore, the development of an effective order picking and routing strategy. This post is an extract from our white paper, Developing an Effective Order Picking and Routing Strategy. The white paper explains what this is and why it is important, then explores the issues, including warehouse layout, storage density, picking strategy, storage policy, order consolidation, FIFO and LIFO implications. This is included in Lesson 2 of training module 6 in our new structure. Check out all of our modules using this link.